We had another uplifting day today. Josie was as happy as can be! She smiled at everyone who crossed her path. They weaned her ventilator but decided not to extubate today. If all goes well tonight, they will extubate tomorrow. Woo Hoo!!!! 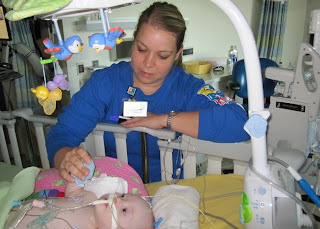 Wonderful Nurse Katie, from the pediatric floor, stopped by the PICU to spend some time with Josie. We love Nurse Katie! She radiates kindness and compassion. Visits from Katie are always appreciated because she has a really comforting vibe which helps keep Josie's neurotic mama nice and calm! 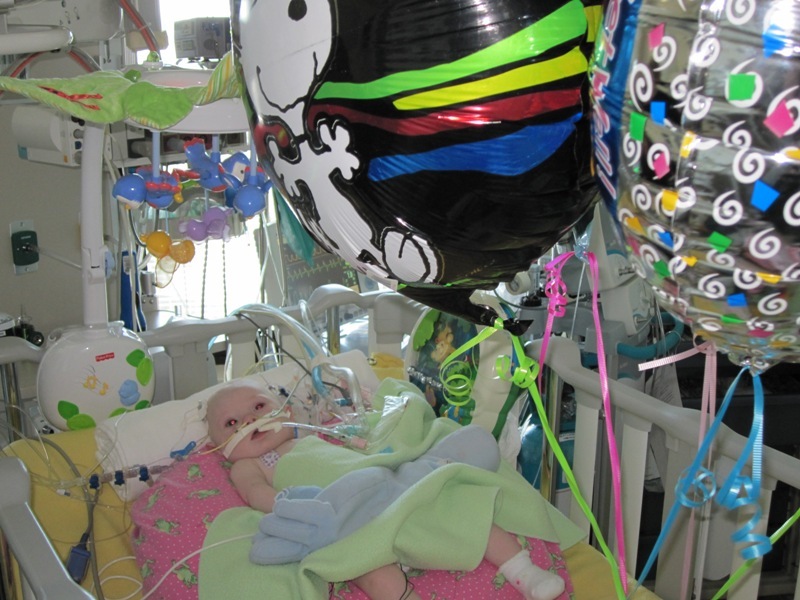 And just when we thought this day couldn't get any better, Josie received a thrilling surprise from blogosphere celebrities, Pudge and Zippy - a spectacular balloon bouquet! Something tells me that sprightly duo knows a thing or two about how make a baby forget she's in the PICU. Josie was captivated by those shiny and colorful floating treasures! This is even better than the ceiling fan! 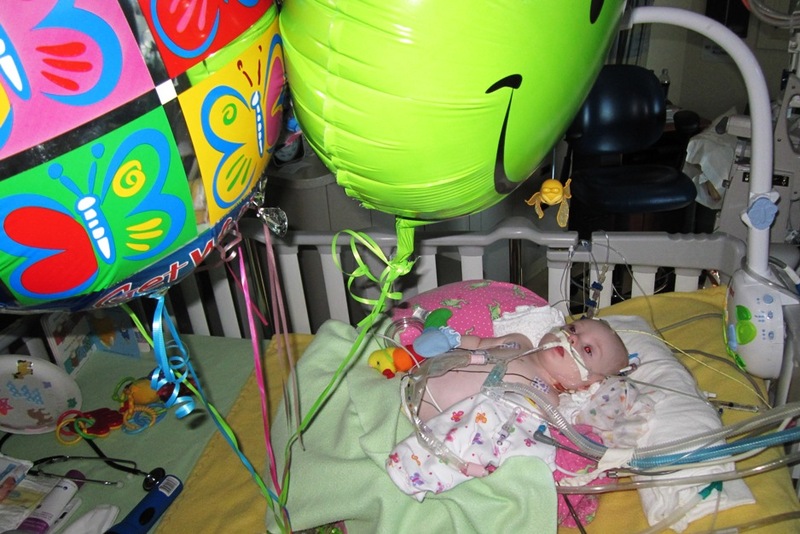 Josie's infatuation was so steadfast that she made those doctors and nurses work around those balloons to check her vitals. It's actually quite humorous to see a resident get tangled in a cluster of mylar balloons while tryng to assess her patient. Talk about the cherry on top of one terrific day! What a heartwarming gesture infused with love and encouragement. Stay tuned for tomorrow's live report! Papa, YaYa, Travis and I are all eagerly awaiting the opportunity to hold our sweet baby Josie once again. We could just burst! How wonderful!! We are so happy for how well Josie is doing, and what a totally thoughtful gift from Pudge and Zippy's parents:) We'll keep praying for continued improvement and total recovery...so glad you get to hold your baby tomorrow!! 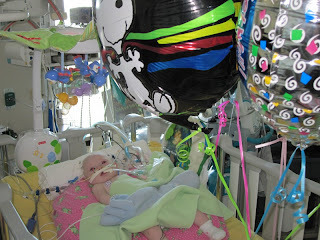 Praying all goes well tomorrow..
Looks like she is loving those balloons from Pudge & Zippy. How sweet! I always thought the fact that I couldn't hold her and have her feel my love and healing was always the hardest. May those moments come today for you and soak them all in:) We pray the night went well and that she has no further set backs and is on her way home! all wonderful news!!! I'm thrilled!!! Love the balloons, i wonder how Pudge and Zip managed all that????? So glad that Josie is on the mend. What a strong little girl. Hang in there, Mom! We're not surprised at all that Pudge and Zip were able to brighten the day. They are sunshine personified. 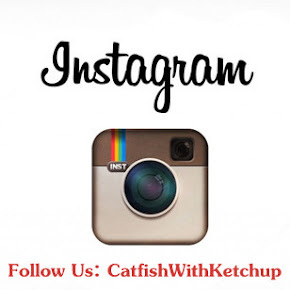 Thanks for sharing your story. Sending love and prayers! I love the wonderful news! Our prayers are being answered! I can't wait to hear that you held her again today!!!! Such great news! Wow, what a wonderful idea, distracting with the balloons! Such great news! We are so happy for you and hope that she is extubated and in your arms as I type. Pudge & Zippy bring happiness everywhere they go. Balloons what fun! So proud of all your hard work, Josie-O! Enjoy sweet snuggles today...I think all of you have earned them. You're our favorite brave little bit of a thing. Yay Josie!! So glad today was so good!